"Lentils, chick peas, and veggies in a highly aromatic stew. This is a delicious and hearty recipe that is worth the effort. I make this ahead of time for the week to come and it is always a hit. Optional garnishes are yogurt, fresh mint, and cayenne pepper." Fill a large pot with water and bring to a boil over high heat. Stir in the lentils, bay leaves, and whole garlic cloves. Return to a boil, then reduce heat to low and simmer lentils until they are cooked but still firm, about 10 minutes. Drain well. Place lentils in a bowl; toss with olive oil, thyme, and 1 tablespoon chopped garlic. Remove bay leaves and whole garlic cloves; set aside. Heat 1 tablespoon olive in a large pot over medium heat. Stir in chili flakes, cinnamon, cumin, and coriander and cook until fragrant. Add garlic, onion, celery, zucchini, red and yellow peppers, and squash; cook 3 or 4 minutes. 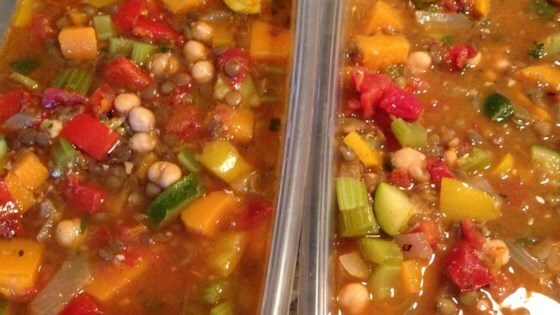 Mix in the lentils, tomatoes, chickpeas, and vegetable stock. Raise heat to medium-high until stew just begins to boil; reduce heat to low and cover. Simmer until squash is tender, about 20 minutes, stirring once or twice. Add the chopped parsley. Ladle into serving bowls and garnish with a dollop of yogurt, some chopped mint, and a pinch of cayenne pepper. A pantry-friendly meal that's ideal for weeknight dinners. This is really delicious. I made a couple changes. First I do not like lentils so I used barley instead. YUM. Also I added about 1/2 cup of golden raisins. SOOOOOO GOOD!